Many of the region’s great gardens began as private rural estates that were away from the distractions and distresses of city life. Reynolda House for the Reynolds family of Winston Salem NC (1917), Cason and Virginia Callaway’s garden in Pine Mountain GA (1952), and Lewis Ginter’s Botanical Garden in Richmond VA (1984) are all examples of early private gardens that grew to become major public destinations. Located at 1415 Kellenberger Road in southeast Greensboro, Miramichi is an early private botanical garden with charms and character cultivated by a notable North Carolina couple, May and J. A. “Kell” Kellenberger. Begun in 1920, the estate remains a privately-owned garden and was never expanded as a public tourist destination. It represents an unusual glimpse into the earliest period of twentieth century botanical gardens of the region. The garden’s creator was May Gordon Latham Kellenberger (1893-1978), a native of New Bern NC, and daughter of Maude Moore and James Edwin Latham. J. E. Latham was a cotton broker who relocated to Greensboro in 1904. When May was 11 years old the family erected a grand house on Fisher Park Circle that is recognized today as the Latham-Baker House, a Guilford County Landmark property. May was educated at Salem Academy, Greensboro College, Converse College, and Barnard College. During the first World War, she served with the Red Cross. In 1920, May married John A. “Kell” Kellenberger (1885-1973), a native of York PA. Kell moved to Greensboro in 1912 and later became manager and secretary-treasurer of the Sterling Furniture company. Within a year of their marriage, the couple began to acquire land on which they would create their rural home. May was no stranger to gardens. Over her lifetime, she was the conservation chair for the Greensboro Council of Garden Clubs, which complied a book on historic trees in the county. She maintained plantings at the Caldwell Log College site in west Greensboro, and oversaw landscape improvements along Wendover Avenue. Over the course of her life, she was most associated with the gardens surrounding her home at 306 Parkway Street in Fisher Park, where she hosted local garden clubs and tours to enjoy rare specimens. She and her mother Maude launched the reconstruction of the gardens at Tryon Palace in the 1950s. However, the garden at Miramichi was her first project. “Miramichi” was understood by the Kellenbergers to be a Native American word meaning “happy retreat.” The Kellenbergers moved into a simple log residence on the grounds with no heating, lighting, or plumbing in June 1922. Work had already been started on the initial landscaping of the grounds. The couple made the estate their permanent residence, living here year-round and doing much of the landscaping themselves. Miramichi was a place that accommodated entertainment and recreation. The Kellenbergers entertained extensively, and the estate provided woodland and lakeside walks, swimming, boating, and fishing. Their garden grew to be a popular location for garden club’s meetings and a choice meeting place for history-, preservation-, and gardening-related organizations across the state. Over their lifetimes, the Kellenbergers were involved in numerous civic and statewide organizations. May led reconstruction initiatives begun by her mother at Tryon Palace in New Bern, and in 1966 she was the recipient of the Louise duPont Crowninshield Award of the National Trust for Historic Preservation, the highest citation for the organization. Kell held charter membership in the Greensboro Rotary Club, was an honorary 33rd degree Mason, and served as director of the YMCA. Both May and Kell were made honorary members of the Governor Dan Moore’s Beautification Committee in 1970. The estate covers 32 acres, and is centered upon a one-and-a-half-story log house. The structure is thought to date from 1835, and features V-notch corner-timber details, a stone chimney, and front porch. The structure was the Kellenberger’s home, and it was heavily altered in the 1920s when they added a half-story and a rear addition that provided a kitchen and library. A later expansion brought more rooms into the house and expanded its footprint to the east. As a restoration project, the home represents one of the earliest examples of historic preservation in the city. Though the house is charming, the estate is most notable for its landscape – a sophisticated but informally landscaped park. A north-flowing stream bisects the property, and the grounds consist of native woodlands and open lawns, complemented by evergreens, wisteria, and periwinkle. Mature specimen trees such as tamaracks, cypress, and hemlocks are complemented with boxwoods, azaleas and an extensive stand of bamboo to define different areas of the estate’s gardens. Man-made elements of the estate complement natural features. 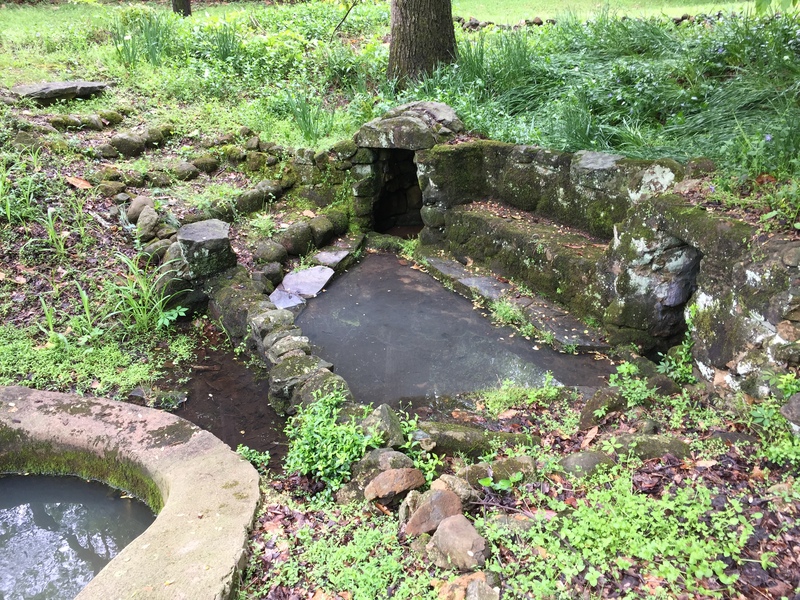 They include stone-lined spring basins of local fieldstone with a bench, a curvilinear pool with a spillway, and a cement lap pool. Larger structures include a dam created around 1915, a picnic structure of cedar logs topped with a hipped roofline, a two-story boathouse with a viewing deck, and an outdoor picnic area with fieldstone chimney. Currently, the lake is drained and elements of the gardens have fallen into disrepair. The estate, including its house, outbuildings, recreation-associated structures, and naturalized landscaping, conjures the imaginative sprit of the Kellenbergers and their ambitious plans for a relaxed country lifestyle between 1921 to 1944. The Kellenberger Estate is significant for its landscape architecture as a rare survivor of a series of comparable rural estates that have stood in Guilford County, ranging from the Jefferson Club off New Garden Road to the Twin Lakes Lodge in southwest Greensboro, and Katydid Mill just a half mile south on McConnell Road. 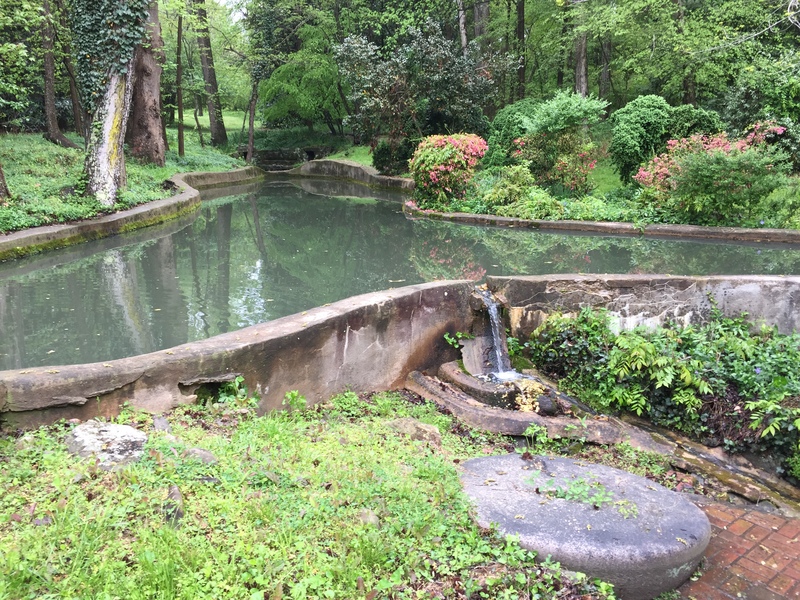 The property remains today as one of Greensboro’s hidden treasures – a well-preserved historical garden representing the early botanical interests of the Kellenbergers as they sought to cultivate a richly-landscaped setting as a focus of regional interest and enjoyment. The Kellenberger Estate “Mirimichi” was inscribed to the National Register of Historic Places in 1994. The gardens have not enjoyed constant care and management over the past several years, but a careful management plan could see the grounds revived to their original spectacular setting for garden events and tours. The property is currently for sale. Preservation Greensboro contributes a key role in the growth of Greensboro’s economy and vitality through tourism, reinvestment, and place-making. With diverse initiatives that help you to restore, explore, and connect with your community, Preservation Greensboro provides a voice for revitalization, improved quality of life, and conservation of historic resources for future generations. Are you a member yet? Learn more about Greensboro’s only member-supported preservation organization by exploring our website or joining our Facebook page. Please join us today!